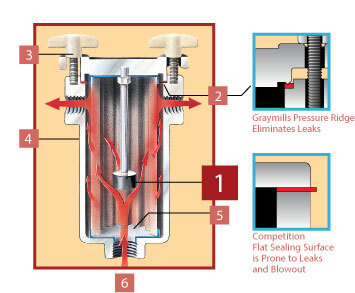 Graymills Superflo® filters are specially designed for flexographic and gravure ink systems, providing effective filtration to eliminate quality problems from contaminants that can also damage costly anilox rolls. Sizes for all printing applications. Filters are available standard (models HFLT/HFST/HFNT) or as surge suppressors (models DDPSFST/DDPSFNT). Superflo® ink filters are designed to overcome the typical pressure drop and reduced ink flow due to clogging that occurs with ordinary filters. A permanent magnet (optional rare earth megaMAG available) suspended over the intake port traps ferrous particles which find their way into the ink and diffuses the flow outward into the filter screen flutes. Filtered material is trapped on the inside of the removable/reusable stainless steel filter cartridge. To clean, just remove the cartridge. All contaminants come out with it. 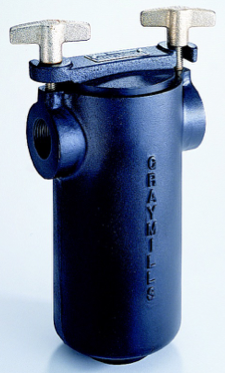 Graymills Superflo® filters are self-draining – no wasted ink or messy leftovers. NEW stronger, smooth, easy to clean magnet suspended over inlet port to remove ferrous particles from the ink before they can reach anilox rolls or print surface. Lid designed with recessed seat and pressure ridge for positive gasket seal. Other manufacturers cut corners and use flat sealing surfaces that are prone to leaks and blowouts. Large, easy-to-grasp metal wing nuts threaded on stainless studs hold up to the rigors of daily use, unlike plastic components on competitive units. Blind threads eliminate dried ink build-up which can interfere with easy operation. Teflon ® coated inside and out. Repels ink for easy cleaning. Will not peel, unlike nylon coatings on other filters. Reusable stainless steel filter cartridge fits into inlet to assure all fluids pass through filter screen without any blow-by. Fluted filter screen increases filtration capacity. 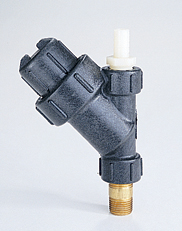 Can mount directly or in-line with pump discharge. Self draining. For use with narrow web centrifugal pumps, diaphragm pumps 3/8” or smaller or peristaltic pumps. High performance non-stick Teflon® coating. 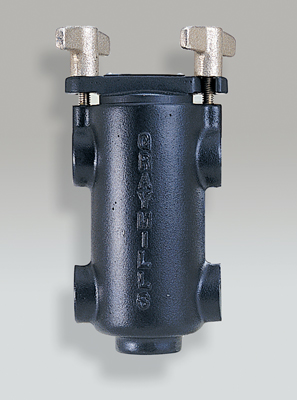 For use with mid to wide web centrifugal pumps or 1/2” or larger diaphragm pumps. For use in narrow web and envelope applications.